Dwight Howard is now the starting center for the Los Angeles Lakers, which gives the team their first viable option at the 5 since Shaquille O'Neal. Much like his large and goofy predecessor, Howard brings a strong scoring and defensive game along with a quirky personality. Unlike him, he seems ready to share the spotlight with new teammate Kobe Bryant. Thus, though he plays a similar game to Shaq, Howard may actually be better than the future Hall of Famer. Yet, some Lakers fans may not be so quick to embrace Howard. After all, O'Neal was instrumental in the team winning three consecutive championships from 2000-2002 and has continued to win new fans in his work as an analyst for TNT's Inside the NBA. No matter how you look at it, that's a big pair of shoes to fill (literally). Still, the fact remains that while Shaq's legacy in Los Angeles may seem like a flame that should burn forever, it's time for the torch to be passed to Howard. He is going to play a huge role in the Lakers making a serious run for the NBA Finals this year, and when the dust settles it's not even going to be a question anymore. In every way, shape and form, Dwight Howard is better than Shaquille O'Neal. One of Howard's problems with the Orlando Magic was that he had no supporting cast. Night after night, the same game plan was used. On offense, get the ball to Howard. On defense, let Howard do all of the work. Now that he's in Los Angeles, he is part of what might be the most dangerous starting lineup in the NBA. His teammates will have no problems shouldering the load and will let him do what he has to do so that the win may be brought home. This is completely unlike the days of Kobe Bryant and Shaq sharing the court, when the two had a well-publicized feud. A decade later, it looks as though the star guard and his new big man will look to work together as opposed to against one another. Now, before we go any further, allow me to say this. Shaquille O'Neal is one of the greatest centers to have ever played the game, having averaged 23.7 points, 10.9 rebounds and 2.3 blocks per game and taken home four championship rings in a 19-year career. Yet, while the defensive numbers are amazing, one thing needs to be noted. At 7'1", 325 pounds, the man was one large individual on the court and hard to get around regardless. As a result, it can be argued that rebounds and blocked shots came to him naturally, thanks to opposing players. Howard, on the other hand, has a much slimmer build at 6'11", 265 pounds. Save for his rebounding and blocking skills, he actually has decent footwork and can cover his man fairly well. So while O'Neal was fine in his own right, he wasn't exactly what one would call a pest on defense, whereas Howard's skills on that side of the floor earned him three consecutive Defensive Player of the Year trophies from 2009-2011. 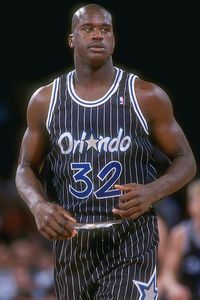 Nothing against O'Neal, but his waistline definitely expanded throughout his career. Once a muscular tank, he definitely lost the battle of the bulge toward the end of his career. As a result, his numbers took a big hit and he looked like a shell of his former self, not to mention that he also spent a lot of time on the bench with various injuries. This is where Howard betters his predecessor once again. While Shaq was able to rely on his immense size throughout his career, Howard doesn't have that luxury. At 6'11", there are plenty of men in the league his exact size. Thus, he has no choice but to keep in top shape so that he can continue to be effective and give his team reason to keep him long-term. Remember when Shaq used to run up and down the court? He did it fine, but there was always something awkward about it. It looked almost like a baby elephant taking its first run. Howard, rather, runs up and down the hardwood with finesse. He has a very lean frame and looks almost like a gazelle when loping from one basket to the other. Even when he's standing and banging for a rebound, he's quite graceful about it. Shaq, on the other hand, used his immense size to just throw his weight around (literally) and knock opposing defenders away so that he could either make a dunk or pull down a rebound. The approach certainly worked, but was nowhere near the definition of superior athletics. While Shaquille O'Neal is definitely a funny guy, his humor comes more from him becoming a parody of himself. Already tall and awkward, he became an even bigger household name by appearing in awesomely bad films like Kazaam and Steel. Also, let's not forget his classic rap hit. Simply put, the man was great at making others laugh, even if it was at him instead of with him. Still, he has become almost clownish today rather than creative. To give you an example, whenever I tuned into Inside the NBA last season, it was more to hear how Shaq and Charles Barkley would go at each other rather than listen to them analyze matchups. Howard, on the other hand, is funny and has some real fun with it. Instead of just being a doof with a deep voice, he does impressions, wears disguises and just enjoys himself every step of the way. Though the paycheck may be nice, it's obvious that he's in it for the fun. If he can bring that laid-back nature to the Lakers for the 2012-2013 season, then the team too will relax and be able to focus on winning a title.